Winners! James, (Kim), Richie and GT. Magpie sailed by Graham Taylor, James Mayo and Richard Allanson sailed the final two races today to seal the 2018 Etchells Australian Championship title by a comfortable nine points and equal John Bertrand’s record of three back to back wins. The Mornington YC crew sailed a very consistent regatta and had impressive boat speed both up and down the course all week. There were two windward / leeward course races on the final day in warm sunshine and winds ranging from 8 - 17 knots. The first race was light and kept shifting in the final moments before the start causing some delays in the start routines. At the third attempt the full fleet of 32 boats got away to sail 1.5nm legs to a windward mark in the lee of Carnac Island. A new race leader emerged round the top mark in Chris Pratt and his crew from Royal Perth YC. The red spinnaker of Sydney based Jeanne-Claude Strong and white kite of David Turton and his Queensland crew were chasing down the first run, which was a fairly even split over the course. The gate rounding was again really packed and a bit frantic. Around the top for the last time appeared the red kite of Jeanne-Claude just ahead of David Turton. These two boats were tied on equal points at the start of the day and Michael Manford’s Croc was a bit buried in the pack. As they came down to the finish line, Jeanne-Claude just managed to cross David Turton’s bow and slide over the line for her first race win. David Turton made a rapid gybe to protect his second position at the boat end of the line from earlier race leader Chris Pratt from RPYC. Martin Hill and his crew from Sydney were back in the mix with a fourth. Graeme Taylor’s Magpie recorded their worst result of the regatta an eighth! The whole fleet of 32 boats finished the course in under four minutes. There was a short wait for the final race when the wind tried to shift again from 210 to 220 degrees. Eventually after another two U flag starts, the final race got going at around 1240pm in a slightly stronger 15 - 17 knots and a building chop. This time the lead boats were again camped down at the pin end, but three were called a bit to eager picking up the dreaded OCS radio call. Michael Manford and his crew Dean McAullay and Nick Gray from RFBYC got a great start at the pin and led around the windward mark by several boat lengths. Again David Turton was in the lead pack but Jeanne-Claude appeared to be deep in the fleet. Another fairly even spread on the run and another congested gate rounding. For the final lap up to the top mark the breeze started getting a bit more perky and the waves building. Michael Manford and the Croc eased to a fairly comfortable victory to secure third position overall in the regatta. David Turton crossed second, an excellent effort for the Queenslanders who also took second place overall on the final day. “We got a great pin end start and managed to control the fleet from then onwards and were really running well downwind. It was a birdie in the last hole, it was good fun.” Michael explained. 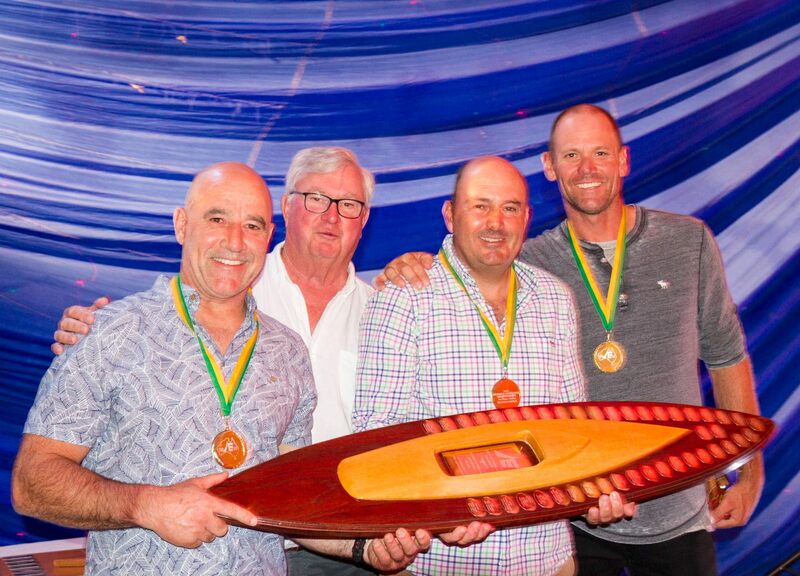 Graeme Taylor, James Mayo and Richard Allanson pulled through the fleet to cross the line third and take the 2018 Etchells Australian Championship title in some style. Jeanne-Claude and her Sydney based crew suffered her worst race score of the regatta (15th) dropping her off the podium but still a very gallant fourth place overall. After Chris Hampton’s great result in race seven he suffered the unfortunate ignominy of losing a crew overboard on the final run causing a dramatic broach. As they hauled him back onboard the mainsheet man apparently fell in rescuing him! Apart from the three boats scored OCS, this was the only DNF. The Etchells crews have enjoyed four days of lively weather and some superb racing. 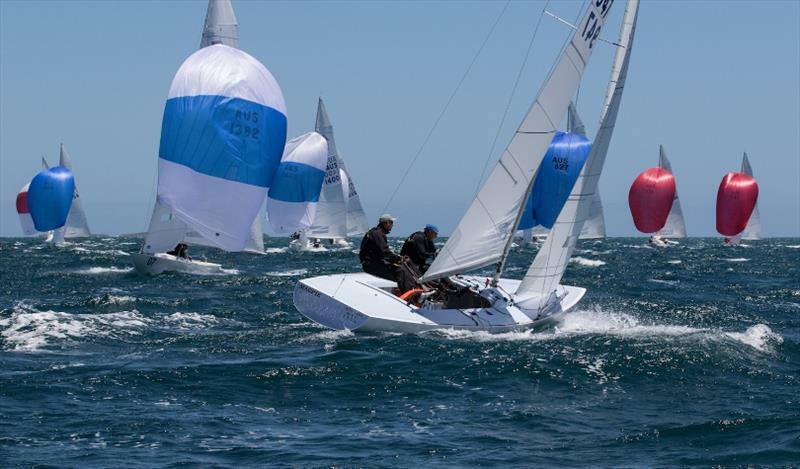 The Etchells fleet will be returning to Australia for the World Championships, to be held Brisbane on the East coast in October this year.